Daniel Hatch. Seed of Revolution. One in a series of stories, following on from ‘Seed of Destiny’ from the Jan 2003 issue, and ‘Seed of Reason’ from April 1999. The story is set on the planet Chamal, which is notable for shared DNA amongst all species on the planet. Said species are Earth-standard anthropomorphic – walking on hind-legs, and living in a society indistinguishable from ours in terms of their culture, their institutions and their beliefs. An academic spat starts off the story, following by a murder, and in amongst working out whodunnit, Hatch takes the opportunity to ponder the nature of an exchange economy, and what happens when a society no longer has wars to drive the economy. Nothing to stretch the reader, and probably not much a stretch for the author. Scott William Carter. The Bear Who Sang Opera. With a cover illustrating the opening Hatch story featuring clothed animals, and the illustration to open that story, this story is also illustrated by a clothed animal – in this case a besuited bear. It’s another animal whodunnit, although to be fair to Carter, his bear isn’t really a bear, it’s a biological-robot hybrid. He’s lost his singing voice, and he recruits a hard-boiled detective to find out what has happened. There’s a horribly inappropriate use of contemporary-to-us-but-not-the-far-future-setting simile, in which a robotic arms is described as ‘silver fingers bent like clamps in one of those arcade games where the goal is to pull out a stuffed animal. There’s also an unintentionally funny scene in which the hard-boiled tech runs into a beautiful, but naked, woman who take umbrage with him, and suddenly kits herself out in boxing gloves and boots to have a go at him (I’ll resist the temptation to offer my amateur psychoanalytic response to this scene). Fortunately, the ‘tec works out whodunnit quite quickly. A sequel to ‘El Dorado’ from October 2007, which saw a noble sacrifice to save humanity from a sun-busting alien attack. With the Bussard Ramjet that was headed into our sun diverted, humanity is able to ponder the alien message delivered at the same time. (Not entirely sure how easy it would be for a completely alien race who has had no contact with us could send a message that we could understand). Realising the aliens are attacking us in the belief that they are doing so because we are an affront to their religion and have offended their god, our response is evidently to let them know that our Big Guy Upstairs is much bigger and badder than their Big Guy Upstairs. John G. Hemry. Failure to Obey. An attack on an orbiting space station gives a crew member the chance to redeem herself after previously having fallen afoul of the authorities (the issue doesn’t refer back to a previous story, and I can’t spot one on Best SF). The protagonist is aided by fortunately waking up prior to the initial attack, but once on the bridge is able to see a flaw in the attack and save the crew and space station. We then move into a detailed (no, overdetailed) courtroom drama in which a third party is court-martialled for non-compliance with orders. The crux of the story is that the attackers followed instructions blindly and were unable to spot the failings of their plan and respond to the off-plan circumstances, whilst the man being charged used his initiative to choose not to follow orders. Fine if you like courtroom drama fiction. Don D’Ammassa. Duck and Cover. Short piece in which a soldier in Vietnam runs afoul of a hard-drinking violent bully of a colleague. In trying to work out how to deal with him, it appears at first that it may be a case of Private Ryan, with a twin, or a triplet, similarly in service and causing problems. The presenting situation with his fellow soldier is resolved, but years later the problem resurfaces. Marissa K. Lingen. The Calculus Plague. 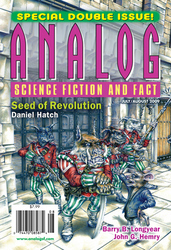 The double-issue full of the usual Analog hard science easy fiction ends with the first installment of a two-parter by Barry B. Longyear entitled ‘Turning the Grain’. © 2019 Best SF. All Rights Reserved. A Dinky Little Websites production.